Today is Wednesday, June 7, the 158th day of 2017 in the Gregorian calendar, with 207 days remaining. Donald Trump has been President of the United States for 139 days. There are 1,324 days remaining in his term, assuming he doesn't resign or is otherwise removed from office. 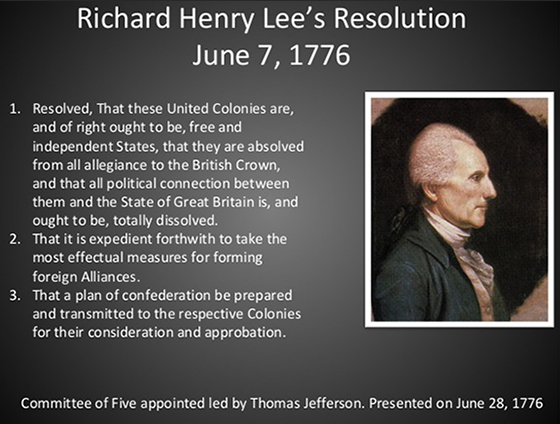 On this day in 1776, Richard Henry Lee presents the "Lee Resolution" to the Continental Congress. The motion is seconded by John Adams and will lead to the United States Declaration of Independence. From the musical 1776: Richard Henry Lee sets off to Virginia to obtain the Lee Resolution. Among other things, today is also National Chocolate Ice Cream Day. Watch: Florida man stuffs 15 bottles of motor oil, 30 DVDs into pants. Today is also the fiftieth anniversary of the death of writer and wit Dorothy Parker. Here's her New York Times obit, and a collection of her quotations. Sorry for the late, abbreviated edition; some unexpected scheduling conflicts and commitments have arisen. See you on Monday. Are Pets the New Probiotic? Epidemiological studies show that children who grow up in households with dogs have a lower risk for developing autoimmune illnesses like asthma and allergies- and it may be a result of the diversity of microbes that these animals bring inside our homes. A new study suggests that even moderate drinking may not be great for your brain. New confirmation of Einstein's general theory of relativity. Thanks, Al. It's nice to know there are some things on which one can depend. Verizon is forced to fix 15,000 "double poles" and other problems in Pennsylvania. The settlement of the union's complaint "will require the company to repair and replace bad cable, defective equipment, faulty back-up batteries, and to take down 15,000 double telephone poles," the Communications Workers of America (CWA) said. Reality returns to Kansas: Kansas Republicans raise taxes, ending their GOP governor's 'real live experiment' in conservative policy. Kansas' legislature is overwhelmingly Republican, but moderate GOP lawmakers joined with Democrats, overriding Brownback's veto of a bill they'd already passed once that would raise taxes again by $600 million a year. Eighteen of the state's 31 GOP senators and 49 of the 85 Republican members of the House voted against the governor. The Mayors of Pittsburgh and Paris: We have our own climate deal. "Though separated by an ocean and a language, we share a desire to do what is best for our citizens and our planet. That means putting aside parochial politics and embracing the global challenge of fighting climate change. In doing so, we can create a cleaner, healthier, more prosperous world for Parisians, Pittsburghers and everyone else on the planet." Comey to tell Senators Trump pressured him to say he was not under investigation. The former F.B.I. director, James B. Comey, plans to testify on Thursday that President Trump repeatedly pressured him to publicly announce that he was not personally under federal investigation in connection with the Justice Department inquiry into Russian meddling in last year’s election. Plenty of nothin': Intelligence chiefs testifying at a Senate hearing said they would not discuss their private conversations with President Donald Trump. Some of America's top law firms don't want Donald Trump as a client. One of the most common reasons cited was the belief that Trump would not accept his lawyers' advice and could send out tweets or other public utterances that would undercut his legal teams' efforts. That, and the fact he's a well-known deadbeat. How Donald Trump shifted kids-cancer charity money into his business. In reviewing filings from the Eric Trump Foundation and other charities, it's clear that the course wasn't free--that the Trump Organization received payments for its use, part of more than $1.2 million that has no documented recipients past the Trump Organization. Golf charity experts say the listed expenses defy any reasonable cost justification for a one-day golf tournament. Eric Trump: Democrats in Washington are 'not even people'. Trump's solar-powered border wall is more than a troll. Despite the president's insistence on getting credit, this is not the first time someone has suggested swaddling the wall in solar panels. During the government's call for proposals in April, a small, Las Vegas-based construction-supply firm named Gleason Partners suggested a suspiciously similar plan. It proposed building a wall of cement, steel, and solar panels. Each mile of wall would cost $7.5 million, it said, but each mile would also generate two megawatts of electricity. This power could then be sold to utilities on both sides of the border. The United States is starting to remind me of the guy in his 50s who's still bragging about his high school football career. China prepares for manned moon landing. Help support KGB Report by making a donation here. via PayPal. Use your PayPal account or a credit card... it's secure and protected. Or, send a donation to me here 1512 Annette Avenue, South Park, PA 15129. Becoming a patron will also get you free copies of any books we publish on Amazon or Kindle in the coming year and reduced prices on any other products. Thanks for your support!